Ben Marston is presenting another four concerts in his annual series. I got to the Big Band Theory outing yesterday, and enjoyed it immensely. 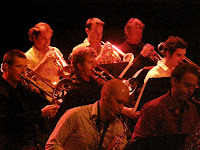 This is a big band in the modern jazz orchestra format, playing charts written by Ben. The sound is smooth, and the horns swell with grace and pleasure. As with most Big Bands, they don’t get together too often, but you wouldn’t guess it from the performance. It seemed well intoned and tight, with a lovely relaxed rhythm section courtesy of James, John, Lachlan, and some wonderfully apt and unforced drumming from Chris. The band was a pleasure. The tunes included some from last year’s outing and even some features that date back several iterations, including the hot features, Accidental instigation and Theophanaic synchronicity – both suitably lively and challenging tunes to end the concert with. 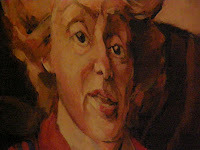 Ben’s two larger works, the African Roadway Suite and his Canberra suite, appeared. I noticed James playing the treacherous African Roadways this year with the double bass, where he played electric last year. I can understand why he’d back off on the fast falling bass line on the second tune, but he did it justice this year on double. There were some intriguing solos: passionate explorations from John Mackey, of course (we expect nothing less! 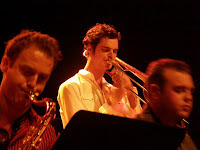 ); a pairing of Joe Lloyd (alto) and James Le Fevre (baritone); a few very tasteful outpourings from Niels Rosendahl; several from Ben himself (it’s his band so he gets to star), Rob Lee on trombone and Lachlan Coventry on guitar. 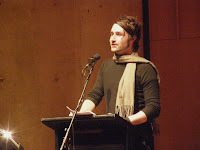 On the day, perhaps I was most taken by Chris Thwaite. 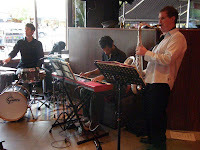 He always plays with taste and perception, but this time he was fabulously relaxed and expressive, and I seemed to settle the band’s performance into a steady groove. I wondered if the groove was a little too laid back at times (but then I do tend to count in at a lively tempo). Ben offered some new charts this year. Five-sty (from feisty) was in 5/4 time: rollicking but none too easy to tap, and with some contrasting horn lines that reminded me of TV cop shows. Undercurrent of discontent was another new one to me, a slightly angry cry with a shared solo on guitar and trumpet. “Choose to be childlike” and “Icy poles, beachtowells & backyard sprinklers” tell of younger, more innocent days, but the playing is no easier because of it. 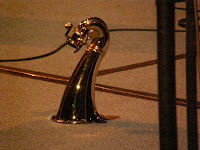 Childlike, especially, had some very difficult writing for the horns. Icy poles was perhaps the most reminiscent of the classical jazz big bands. But I think my favourites on the day were the two ballads, Lament for music, beautifully luxuriant and a lovely vehicle for John Mackey to express on, and Autumnal from the Canberra Suite, that just glowed with swelling horn lines. Gathering a band like this is a labour of love, and Canberrans should support it with a regular audience in addition to their government grants. Well done, to the band, and to Ben for leading and for all the charts. A great achievement. 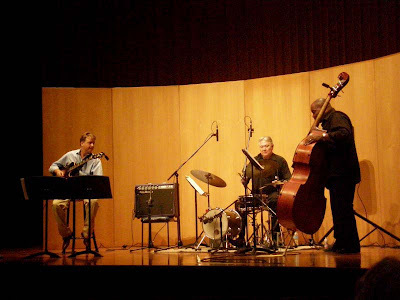 I was thinking that only an old culture could produce the music and performance of Carlo Actis Dato’s Quartet. 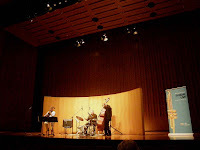 They played an amusing, oddball, diverse performance at the Jazz School last night on their way to the Melbourne International Jazz Festival. Oddball because of the chatter and zany performance that accompanied the music: chuckling introductions variously in English and Italian; animal sounds on alto on request; a dismantled bass clarinet as performance art; saxers disappearing into the audience or unexpectedly reappearing at the back of the space; dancing with the local ladies. All performed good-naturedly, with uproar and whimsy. The Italians in the audience caught the banter better, and so went along for the ride, even if the English monolinguals missed the point. 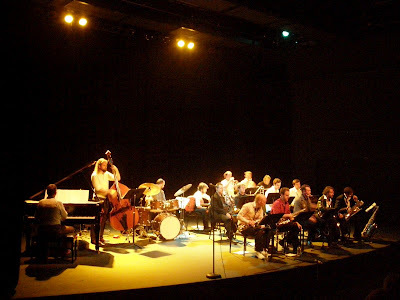 Some jazz students I talked to seemed dumbfounded, but they recognised it as “fun”. The musical references were also evidence of an old culture. 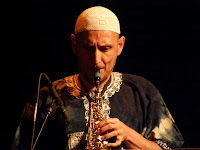 References were taken from across the north of Africa, the Middle East, Eastern Europe and local sources: a melange of Mediterranean musical traditions, rich in history and folk customs, in varied scales and tempos. We heard simple melodies over marches or odd times, but played with the release and ecstasy of peasants around an open fire: rabid solos displaying instrumental expertise, frequent interaction of the horns out front, squeals and pops and flourishes. And voices. The band started and ended the shows with chants; there were humourous shouts and admonishments throughout: calls to the stars; demands for animal sounds; a mock battle over the drum kit. All “strano” (Italian “strano” is more apt than English “strange”; more eccentric than grotesque) and entertaining. And neither were these musical slouches, despite the humour and unusual tunes. 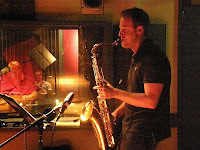 Carlo leads on baritone sax and bass clarinet. 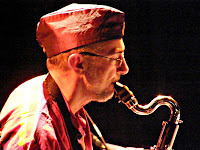 His list of jazzers he’s played with includes the like of D. Murray, L. Bowie, C. Taylor, E. Rava, D. Sanborn. So no slouch, and quite demanding and out there. 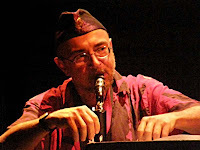 Beppe, on alto and soprano saxes, was of a similar era, and seemed a good match in musical and individual personality. Matteo and Daniele were of a younger generation, but fitted well enough with the mature mania. The playing was eminently capable, especially from the horns in the front line, but I didn’t notice till I listened back to a recording. On the night, the performance was the thing, and the music was just one element. But the furious melodies were played with accuracy and intonation, and the solos clear and articulated and responsive when they often dropped into paired horns. But this was not a night for Coltrane virtuosity (despite the ability of horns up front), but rather of musical geography, and they carried it off with aplomb. And that maturity of the cultura vecchia. I saw Sun Ra in Rome many years ago. Sun Ra fits this story. The informed zaniness of the cultura vecchia goes with the territory. So it was intriguing and a blast to hear Torino’s and Italia’s renowned Actis Dato here in Canberra. It was not just musicianship, but musical geography and entertainment to boot. Thanks to the Italian Embassy for bringing this explosive entertainment to Canberra. 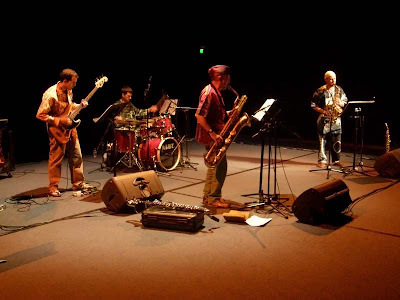 The Actis Dato Quartet was led by Carlo Actis Dato (baritone sax, bass clarinet) with Beppe di Filippo (alto & soprano sax), Matteo Ravizza (electric bass) and Daniele Bertone (drums, percussion). 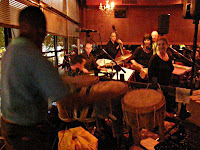 Afro Blue is a famous jazz tune which talks of Africa. I heard strains of it as I listened to Mosaic the other night at Hippo, but it doesn’t convey to me the complexity and richness that I was hearing. Judy Campbell’s Mosaic is a clear work of love, and the smiles and rapture of the front line make that obvious. Love of the richness of African culture, its drumming, its vocals and chants, and the lanky joyousness of sub-Saharan Africa … at least as I imagine it. I feel I know so little of Africa, other than sad stories of bad regimes or mad wars or starving villagers. There is so little else on our media that I was taken aback to hear a normal current affairs show dedicated to Africa on the BBC World Service recently. It suggested an Africa that was stronger, more educated, more positive than I’d thought. It’s embarrassing to be so ill-informed, but we are all products of our environment. (The same thought comes to me when I listen to ABC RN’s Awaye, which presents Australian Aboriginal society in a positive cultural light). 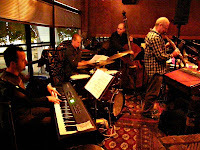 In the meantime, at least we can respond to their music, and it’s an easy and entertaining step for jazz lovers. 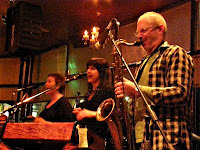 Mosaic has a front line of three: Judy and Justine on vocals, and ex-South African Mark on saxes (tenor and soprano) and vocals. The three vocalists made for much of this joy. The voice is a sublime instrument. 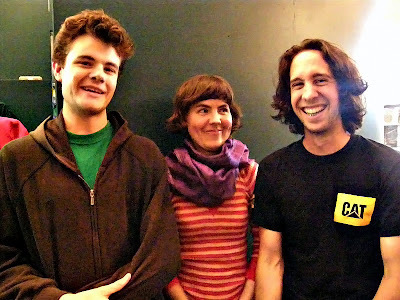 These three sang unison, or less commonly, harmonies on meaningful lyrics and tuneful melodies, sometimes with odd scales (at least some sounded Jewish) or rapid, jagged rhythmic passages. 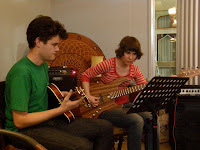 They also dropped into percussion of various types, especially Judy who played an array mbira, a tuned spring instrument that she played with challenging, counter-rhythmic timings. 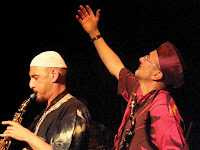 If the front line was a joy, then so much so was the rhythm section (we are talking Africa, after all). 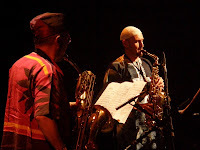 There was not a walk anywhere in sight, but strongly defining rich, deep bass notes from Karl, and some wonderfully fluent, talkative solos and long, long unison lines with piano or sax, behind vocals or other melodies. Greg, too, played some fabulous solos, moving freely through modal chords. He really was strong and satisfying in this style and the lines just flowed with joyous energy. Then to the talking drummers: so they were. Tim Firth was wonderfully in form, playing in a style that fitted admirably within the African idiom. I pondered what study he’d done in African drumming, because it seemed convincing to me in its authenticity and a long way from standard jazz fours. I was stunned by some fills that mimicked the front line and wondered how well practiced were these guys, or was it written. 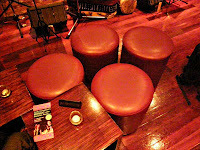 And I was taken by a drum/percussion solo at the end of the night where parts was passed from Bandika to Tim, and the African rhythmic sense was maintained with aplomb. So to Bandika. 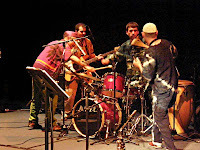 He was on the other side of the stage, so I missed much of his complexity, but you could feel the loping rhythms and complex grooves of Africa, inherent and mirrored in the rest of the band and growing from the percussive richness. 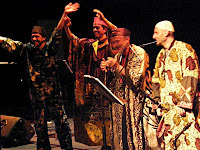 This is what makes for that rolling, danceable groove that we know from Africa. And the whole of the rhythm section just loped along with it. Bandika took a few solos, too, and you would not believe the volume from his djembe. Really, really loud and cutting, so Tim’s kit with sticks was left in abeyance. Were his fingers taped, like I seen on conga players? Nope; how tough must they be? Bandika also sang, and this was where I really heard another culture: fast, tangled lines of voice that sounded other worldly. Couldn’t be further from Madonna despite her adopted associated with Africa. But Bandika is a Kenyan master drummer, and this takes time and study, and the difference is inevitable, as well as fascinating. This was intriguing and enlivening and human music, and I loved it. Give me more anytime. If world or folk festivals had more like this (and fewer Morris men and earnest singer-songwriters), you could expect to see me there. But for the meantime, I’ll just expect to hear it in jazz circles. OK by me. 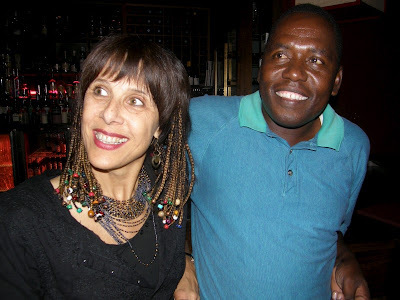 Judy Campbell’s Mosaic comprises Judy Campbell (voice, array mbira and percussion), Mark Ginsburg (saxophones, voice, percussion), Justine Bradley (voice), Greg Coffin (piano), Karl Dunnicliff (bass), Bandika Ngao (percussion, voice) and Tim Firth (drums). 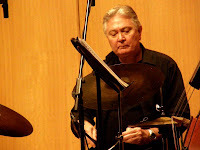 It was like Chamber Jazz with capitals when Mike Price played with the Trio at Llewellyn Hall for a live broadcast to ABCFM. It’s a calm environment, quiet and respectful (nothing like a bar) with timber everywhere and a listening audience whose applause is nicely delayed so as not to mix in with the tune. 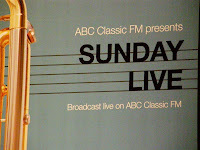 I guess this is more a classical audience, because most of the FM live broadcasts are classics. Also “chamber” because Mike’s trio reminds me of the clarity and precision of the MJQ and that era. 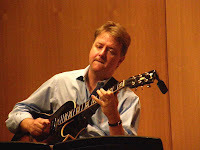 Mike’s guitar, clear and woody and unadorned, playing neat and controlled patterns and sequences and scalar runs with the skills that his students so admire in him. And accompanied by equally admired fellow faculty from the Jazz School. 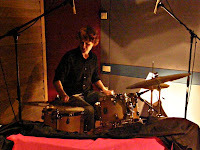 Col with reliable grooves and surprisingly varied tones coming from his minimal kit of bass drum, snare, hi-hat and a few cymbals, using brushes and palms and some orange plasticy-looking sticks for a thin but effective percussion. Eric with his silky skills and wonderfully expressive solos on his Star-Trecked double bass (a joke from Mike on the night) fed into a PA speaker. They seem to have done work on the Llewellyn, and it was better than previous jazz outings. The upper registers were clear, if overly strong and reverberant, but the bottom end remains wet and mushy and Eric’s wonderful playing fell into it. [PS. Am I being unfair here? I definitely couldn't hear Eric too well except in solos, but maybe his amp was turned down given that it was so close to his and Col's ears.] I’m told that the broadcast was beautifully produced, even album quality, but the live sound was disappointing despite the work that’s obviously been done. The trio mostly played tunes by Mike himself. The opener, The Plot, was in triple time. 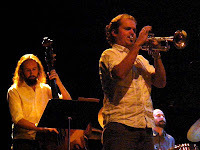 Trip to Peekskill was in memory of lessons with John Abercrombie, a long time influence. The Gong was dedicated to his home town, Wollongong, and bounced with a country/train feel and was well received. Off break started in a two feel then dropped into hard swing. There were also a few non-originals: Just in tune by Abercrombie, Kind folk by Kenny Wheeler, and Brubeck’s In your own sweet way. 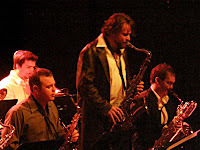 And nice to hear national broadcaster, Julian Day, commenting on the current richness of the Canberra jazz scene, given the small size of our town. He’s right, you know. Lots of work for players and plenty of interest around the bar scene. We’re going great guns down here, thanks especially to Mike, Col, Eric and their faculty colleagues (and a few other committed people round town). New Dad Ben (girl, 10 days) was out for his first gig and his Hammond left hand was defining the coolest blues-infested groove in town. 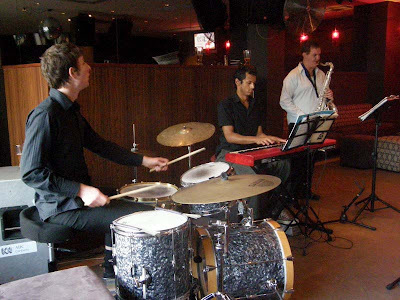 The James Le Fevre Trio was playing at Minque, and the place was jumping. 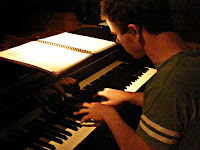 The sound of the Hammond organ with left hand bass is unique and a defining sound in jazz. It’s not all that common, but I’ve heard it a few times recently, and I wonder if it’s having a comeback. 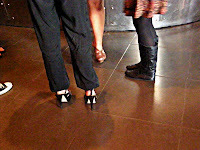 It’s quintessentially cool and lounge-like, so fits the bar scene that’s so common today. Certainly it seemed that way from the audience. The first audience responses were ironic, but by the end the joint was jumping and the guys (yes, guys) were up dancing together, presumably their moonwalks were to impress the girls who couldn’t dance because of those very high heels. But it was all a relaxed and well-entertained scene, and I could see why a bar would book it. But back to the music. Ben was Hammond man, with that simple but driving left hand that sat with Evan’s richly embroidered and unwavering groove. The two formed a band in themselves, even without solos or melodies above. You noticed it when James ended a solo, and Ben let it sit back and settle before his solo, when it sat so tense and infectious, waiting for another lead. 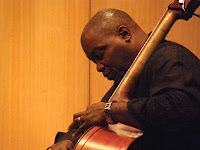 James’ tenor was clear and wailing above this groove, quoting liberally and playing increasingly open and substitutionally as the day moved to evening. I’d thought of James as a bluesy hard-bop mentality with occasional screaming outbursts, but this was a more thought-out and substitutional James and I liked it. Ben was the essence of cool, not just in left hand, but in visage and presence and solo. 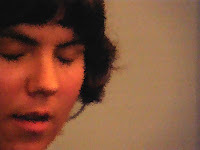 Perhaps it was that wave of new father’s tiredness setting in during the horn solos, but he just sat with closed eyes in concentration, and played a growing storm in every solo, while Evan just grooved with a lanky presence with the smoothest of accompaniments, rich in colour and style, and let out these so sweetly enunciated solos that just fell from his sticks. I didn’t stay for the whole session, but I felt it growing in complexity and strength as the two first sets wore on. The first set was blues and Corea’s 500 miles high and Milestones and Corcovado and hard-bop standard Cold duck time. The intensity was growing by the break, with that so-solid left hand of Cold Duck time (what is Cold Duck time, anyway?). The second set was against a busy and darkening Manuka main street and it just kept lifting. A Bb blues and Jobim and a medley leading into All Blues, and then I was taken by a trio of favourites: Love for sale, Desafinado and Caravan. By this time, the guys were up dancing, and there was a real buzz. Everyone well set for a night out. The band had done just as the band should do: Hammond-smooth and lounge-lizard-like and readying everyone for a night on the town. Scene set for the night and the thousand eyes. 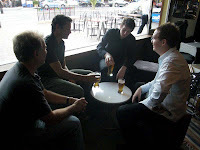 James Le Fevre (tenor) played with Ben Foster (Nord keyboard as Hammond) and Evan Dorrian (drums) at the Minque Bar in Manuka. 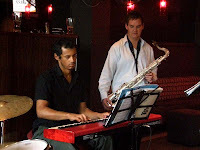 I usually hear the Rafael Jerjen Trio as a melodic and technically understated band, not ignoring skills but solidly interested in the musicality. So it was a surprise to hear their broadcast start with a cacophony, but that soon settled into a more modal-sounding walk with an attractive sax line over the top, so I was back where I expected to be. 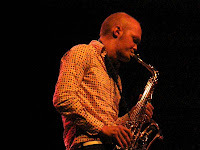 Niels was settling into one of his effective and technically restrained solos – clear in purpose, well developed and true to the tune. Luke followed with a little more rabid interpretation, but still within bounds, then Raf’s bass solo, blues-infused and fairly laid-back. The whole was purposeful and true to the form. Raf writes most of the tunes for this band, and you can often hear the bass in these conceptions. The second tune was clear in this respect, a call and response melody sitting over a repeating syncopated bass figure which moved up in pitch for a B-section. 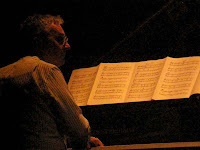 The third tune was a piano trio setting of a Paul Grabowski arrangement of Julia by the Beatles. I show my age, but I didn’t find the arrangement too satisfying, given the simplicity and purity of the original, but it was interesting and experimental breaks with the past are necessary even if not always successful. The band returned for a second set with another solid post-bop walker with Luke in full swing, and then a few differing styles to finish. For Leo was a Rafael original written for a classical guitarist mate. 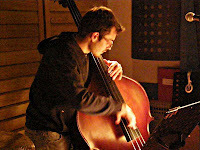 It featured a bowed bass and lento rhythm with a meditative melody, leaving space for plaintive tenor from Niels. Twice in a lifetime was a funky blues with some lovely edgy piano from Luke, a solid solo into thumb positions from Raf and a short cross-time solo from Aidan. 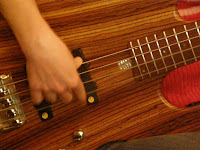 To end, Raf played a new solo bass composition, Tamryn. It was another restrained tune, chord-rich with a rising chromatic theme. I did like this. Cacophony to dedicated bass solo is quite a ride. This one ultimately ended in a modern-mainstream mostly post-bop style outing, although with some personal twists. 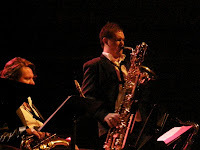 And it’s these personal twists that make for another voice in jazz in Canberra. 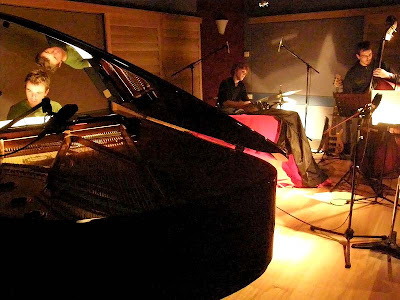 Rafael Jerjen (electric, acoustic bass) led a quartet with Niels Rosendahl (tenor), Luke Sweeting (piano) and Aidan Lowe (drums) at ArtSound. Right from the start, I noticed a lovely, lithe rhythmic form in Zoe Frater’s bass in accompaniment: implying rather than stating the beat; playing over it with shorter, bouncy notes; a natural control of note formation and duration. Then a solo which remained within the underlying harmonies, but which was wonderfully melodic, with lines of extensions, openly moving through the scale, but delightfully intervallic rather than scalar or arpeggiated. 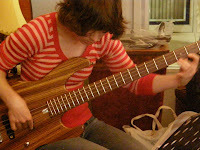 And a good right hand forming the notes, so they sounded solid and thumpy, and doubly so when she dropped into short passages of thumb picking. Zoe’s fine fingers and lithe movements were spider-leg-like as they stretched and retracted over the fretboard, not hard set in a defined shape, but mobile like her lines. Such lovely lines of varied intervals, unexpected jigs and patterns, but always true to melody. Zoe was accompanied by John Milton, a Canberra friend who organised the gig, and Andy Campbell, who got thanks for learning all the tunes. And they were an interesting mix of the modern and melodic. 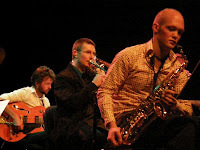 Several from each of the players, and several from Steve Swallow, an obvious influence and subject of Zoe’s Melbourne band called Swallowing. 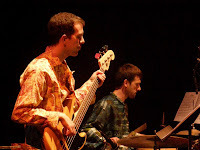 Steve Swallow is one of the few famed electric bass players in jazz, with a similar concern for, and love of, melody and song forms that reminds me of Charlie Haden. 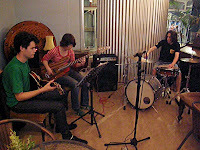 But Zoe also admitted of other influences, presenting tunes named for Bill Frisell and the Police. 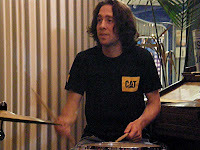 John was playing with tonal simplicity on a small kit, but with reactivity and closeness to the statements of the others and sometimes with some outspoken polyrhythms. I noticed a steady gaze that watched the others while their heads were down in concentration, like I’d seen in John Pochee a few days before although not so constant. Andy was strong and fast, somewhat of a different style from Zoe but perfectly fitting. 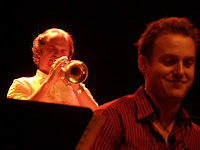 His was more scalar and quicker playing, not so much considered and exploratory as enthusiastic and ecstatic in solos. All round, they were playing tunes new to them, some with long and extensive charts, so the playing impressed me as capable and well-read and nicely settled. The volume of the whole was restrained, being in a very small, intimate room, with just a few listeners clustered around some coffee tables and surrounded by rows of original orange and blue Penguins: an intimate and intellectual environment for soft jazz statements. It was a lovely little concert in an unusual venue at an odd time (5-7pm on a Tuesday evening) but very much enjoyed by those who attended. Doubly so by me and a few e-bass fellow travellers watching a very capable and expressive colleague. Zoe Frater (electric bass) played with Andy Campbell (guitar) and John Milton (drums) at the beyond Q Bookshop in Curtin Shops.